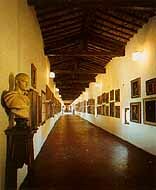 The Corridor was built in 1564 by Giorgio Vasari in only five months at the time of the wedding between Francesco I de' Medici and Giovanna of Austria; it served to link up the Pitti Palace, where the Grand Duke resided, with the Uffizi (or offices) where he worked. It is a covered walk, almost a kilometre in length, an overhead passageway that starts out from the West Corridor of the Gallery, heads towards the Arno and then, raised up by huge arches, follows the river as far as the Ponte Vecchio, which it crosses by passing on top of the shops. The meat market on the bridge was at this time trasferred elsewhere, so as not to offend the Grand Duke's sensitive nose with unpleasant smells on his walk, and replaced (from 1593) with the goldsmiths who continue to work there today. 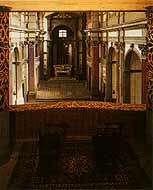 On the other side of the Arno, the corridor passes through the interior of the church of Santa Felicita, over the tops of the houses and the gardens of the Guicciardini family until it finally reaches the Boboli gardens (one of the exits stands beside Buontalenti's Grotto) and the apartments in the Pitti Palace. Vasari thus created a monumental urban "footpath" that took the absolute power of the ruler right into the historic heart of the city. In fact, a second corridor above Via della Ninna links the other side of the palace of the Uffizi with Palazzo Vecchio, the seat of Florentine government since the 13th century. The Corridor was restored and reopened to the public in 1973 but can only be visited by appointment or to groups (the entrance is between rooms 25 and 34). Apart from the fact that the visitor can enjoy some magnificent and little-known views over the city from its round windows, the passageway contains over 700 paintings, all dating from the 17th and 18th centuries, as well as the important collection of Self-portraits by some of the most famous masters of painting of the 16th to the 20th century. This collection, unique in the world, was created by Cardinal Leopoldo de' Medici in the mid 17th century, a golden century for collections, and receives regular additions to this day. It displays self-portraits by Andrea del Sarto, Beccafumi, Bernini, Annibale Carracci, Guido Reni, Salvator Rosa, Rubens, Canova, Hayez, Corot, Ingres, Delacroix, Ensor and many others.